Ostrich feathers are the most elegant and luxurious feathers available. By using only one or two Ostrich feathers, you can change the entire look of anything, for example to adorn band hats, flapper headbands or as a single plume on a wedding pen. Ostrich feathers are spectacular as showgirl headdresses, and large feather fans. 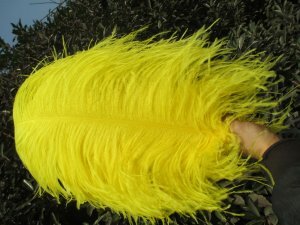 Ostrich feathers are very popular in the special event Industry, as a staple item for centerpieces, feather palm trees. We can also dye any colors as per your requests.